Want to live longer? Your odds improve if you are a rich, well-educated Asian or European woman accountant who engages in moderate exercise. If you are an overweight retired professional football player, your odds of having a shorter than average lifespan are high. Olympic athletics have a longer than average lifespan, while athletes who engage in contact sports have shorter than average lifespans. Contact sports frequently cause a variety of damage to the bone and skeletal system, as well as to the brain, whose effects grow over-time. There actually was a recent British study whose authors claimed that accountants do have longer lifespans, without a good explanation as to why — so feel free to conjure up your own explanation. I have noticed that many of my fellow economists seem to have lived unusually long lives, particularly those who won Nobel prizes. Being president of the United States, at least in recent times, is associated with a longer lifespan. President George H.W. Bush engaged in a vigorous lifestyle, including sky diving in his 80s, and having his plane shot down from under him in World War II — and yet he managed to live to be 94. Both Presidents Reagan and Ford lived to be 93, and Jimmy Carter is still alive at 94. It is intuitively obvious and empirically shown that people in rich countries tend to live longer than the average person in a poor country. 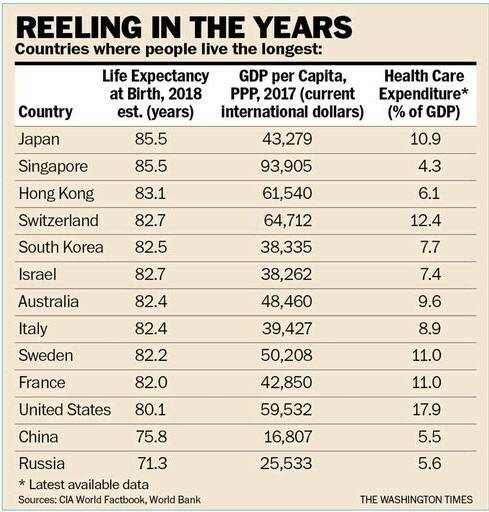 It can be seen in the accompanying table that those of Chinese ethnicity in Singapore and Hong Kong live considerably longer on average than those who live in mainland China. As China has grown from a poor county to a low middle-income country, lifespans have also greatly increased. It would be expected that if China completes its economic journey to becoming a high-income country, the average life span in China would approach those living in Hong Kong and Singapore. There are a number of very-low-population jurisdictions (under 500,000), where people have on average very long lifespans, which are not included in the table. The average person in Monaco lives an incredible 89.4 years, but there are only 39,000 people in the principality. The residents of Macau, San Marino, Andorra, Iceland and Guernsey live on average from 82.7 to 84.6. None of these places have a highly intrusive government, and several have no income taxes — which should reduce stress. Average life expectancy is a good proxy for how effective a health care system is. It is often noted that the United States spends far more, both as a percentage of GDP and in absolute dollars per capita, than any other nation, yet only ranks number 43 in terms of life expectancy. Given international norms, the U.S. should be able to improve its overall health and spend half as much per capita. Yet, most of the proposals that the political class is discussing would likely increase health care spending as a percentage of GDP, with no reasonable assurance of improved outcomes. One great tragedy is that lifespans have been decreasing for the last couple of years in the United States because of overdoses and addictions to opioids. Singapore arguably has the world’s most cost-effective health care system. On the basis of absolute dollars spent, rather than as a percentage of GDP, Hong Kong, South Korea, Israel and Italy do about as well. A number of countries do an adequate job of providing general health care but rely on other countries — most often the United States — to supply both discretionary and extraordinary health care. The deficiencies and queuing in the Canadian system are in part alleviated by Canadians going to the United States for care they cannot get in Canada. Medical tourism is growing in many parts of the world, where first-rate doctors can perform a number of difficult procedures for far less cost and at higher quality than can be found in many people’s home countries. This is possible because they can avoid many unnecessary government regulations and mandated procedures. Some places in Southeast Asia have been in the medical tourism business for decades, but now even places like the Cayman Islands have joined in by building world-class private hospitals with excellent doctors and support staff. For at least three decades, renowned scientists have been claiming that within five to 20 years the key to the aging process will be unlocked, and aging will not only be stopped, but reversed. It is frustrating for us, members of the Committee Against Death and Taxes, that our progress has been so slow on both fronts. It is getting to the point that, if we don’t “cure” death, the fight against taxes will be irrelevant for most of the committee members. © Copyright 2018 The Washington Times, LLC.